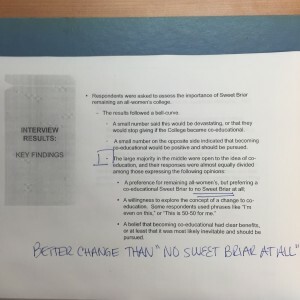 Elizabeth Wyatt’s June 3, 2015 letter in the Wall Street Journal, “We Tried Hard but Sweet Briar’s Problems are Terminal” and Diane Dalton’s letter in the Washington Post called me to both respond to the article as well examine some of its points. Given that all parties in the Sweet Briar College matter are gathering in good faith in mediation facilitated by the Attorney General, I continue to find it surprising that the Board’s Vice Chair would pursue stories like this. It seems the very opposite of having a good faith effort towards mediation. What disturbs me most about the letters by Elizabeth Wyatt in the New York Times and Diane Dalton in the Washington Post are the continued use of questionable “facts” and figures. They are using figures which Sweet Briar itself now questions. 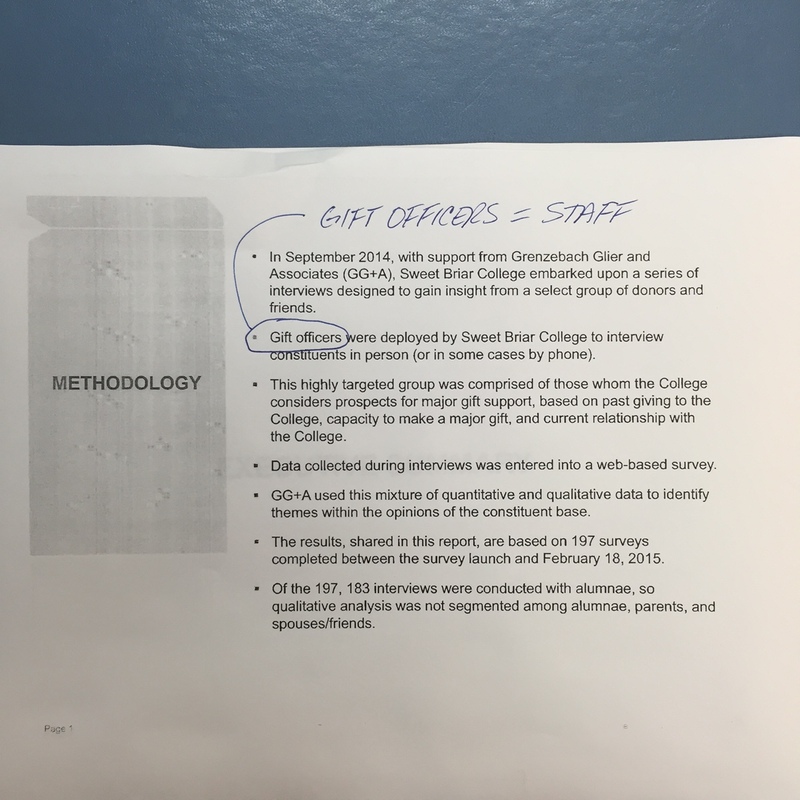 They are using reports (such as the Sax Report) that do not meet academic standards. Now that I have READ several of the reports, I interpret that the Board saw a “falling sky” where others saw rays of sun. The Donor Insights Survey (which the board members erroneously refer to as a “Feasibility Study”) is one such report. As fundraising is where I spent my professional time, I found this report particularly interesting. 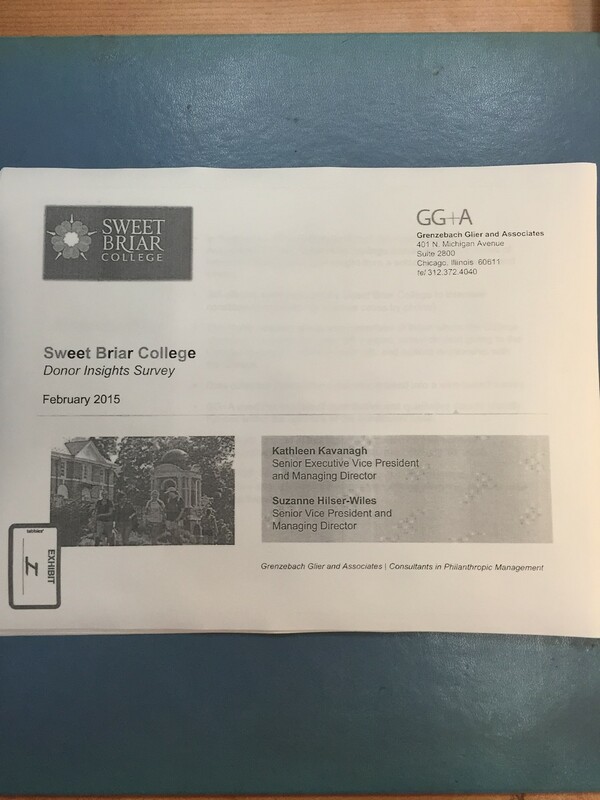 Donor Insight Survey, February 2015 – delivered just one month before the College Board voted to close. This survey was conducted by a very reputable firm, Grenzebach Glier and Associates; however, the consultants themselves were not used for the actual interviews (which is customary in an actual feasibility study). The College sent staff members to visit donors. As a result of this methodology (which the consultant discloses in the report), the results were bound to be a bit suppressed (more on that in a moment). 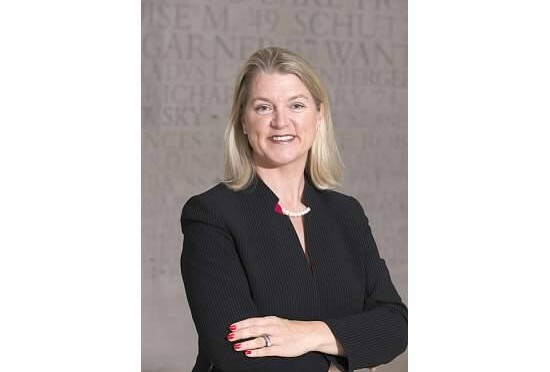 Kathleen Kavanagh, Senior Executive Vice President of the firm, and a Sweet Briar alumna, is a well respected leader in the field. I put great stock in her work product and I see the merits of the report she provided. She has provided consulting for a long time at Sweet Briar including when I worked there. What I disagree with is the misunderstanding of the purpose of the report, the misuse of the findings and the Board continuing to use the report as a compass pointing towards closure. As I read the Donor Insights Survey, I actually see many hopeful things which the Board obviously chose to disregard or overlook. But the real issue is this — whether this report was used as justification not to do fundraising and to close the College or not — WE NOW KNOW THAT A FUNDRAISING EFFORT IS INDEED POSSIBLE. My question now is this… WHY DON’T YOU LET US TRY??? The following is a response to Ms. Wyatt’s opinion in the Wall Street Journal (and elsewhere)…. 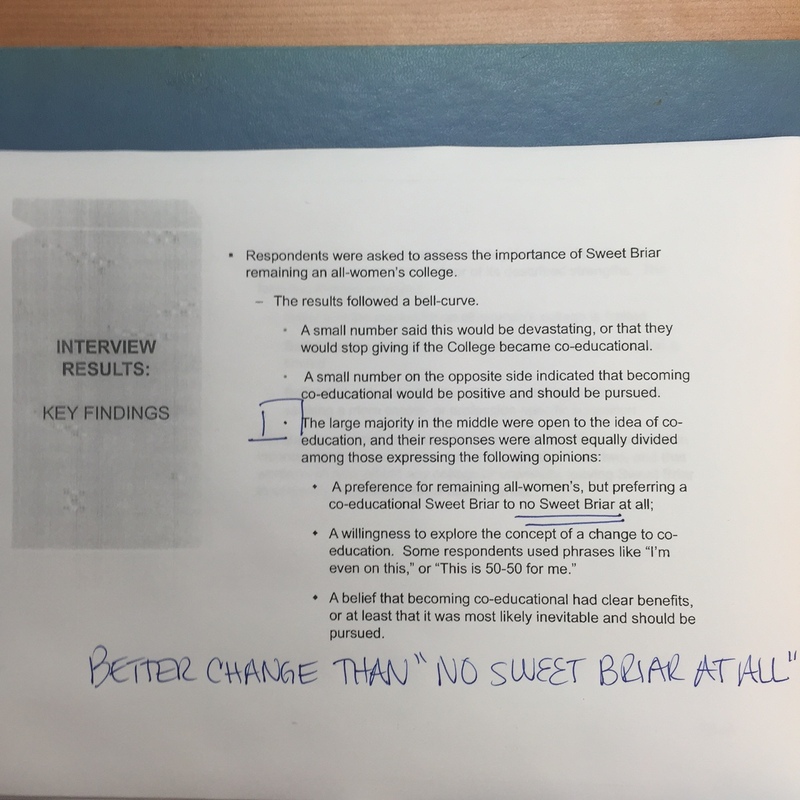 “We Tried Hard… but Sweet Briar’s Problems are Terminal”: The numbers were not in our favor. Any effort to reinvent the college would require significant investments of time and money. Ms. Wyatt, help me understand as a Board Vice-Chair, Sweet Briar alumna and business leader how you and your colleagues on the Board would not have read further into the studies for which you paid. Help me understand how you repeat the same facts and figures based on figures your own team is now revising? Help us understand why you did not undertake a fundraising campaign. It seems that this Board saw storms where others saw rays of sun. We now know that the alumnae of Sweet Briar College are WILLING to”expend the NECESSARY investments of time and money” to which you refer. It is clear you “tried hard” and that is just not good enough. Step aside, Ms. Wyatt, and take the rest of your Board colleagues with you. As someone who has worked in higher education for the majority of my career (including at Sweet Briar), I continue to find the behavior by this Board and the actions of the current administration very hard to understand. You continue to repeat the same facts and figures (most of which have been debunked by numerous experts) and fail to provide copies of the reports on which you base your decisions and with which you used substantial Sweet Briar College funds to secure. Fortunately, some of your reports are making their way to the public eye and they do not reflect well on your analysis, decision-making or choice of staff. Yesterday I received a copy of the Donor Survey cited in your recent article. Since you refer to the reports as the basis for your decision-making, let me focus primarily on the Donor Survey since that is the area I best understand. I will leave the analysis of your financial stewardship to other experts such as Dan Gottlieb, a professional forensic accountant and your own legal team now restating its finances with a $17 million rounding error and misstatement. I commend to your reading, Jay Orsi’s piece “Sweet Briar’s Own Expert Uncovers Misrepresentations In Its Financials”. 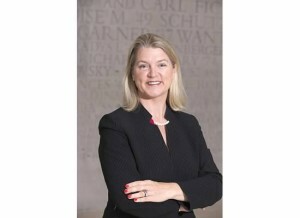 Ms. Wyatt, I have served as an Executive Director of a Board, I have served on nonprofit boards and I have worked at Sweet Briar under fantastic financial and development leadership. While the hiring of such people is left to Presidents, the review of their work product is the work of the Board. The Board has clearly failed in its review of key documents as well as its vetting of reports provided for its decision making. I understand that the firm who did this study was NOT charged with testing the ability of the College to raise funds. 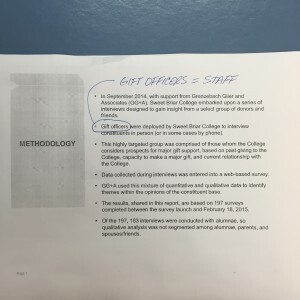 Rather, their charge was to test with the College’s generous donors their reactions to various strategic planning priorities. The firm was just as stunned as the College stakeholders to learn of the decision to close. To refer to this report as a “feasibility study” (as you do in your article) is misusing the report and is not fair to the firm who conducted it. 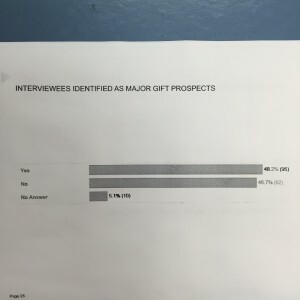 Methodology: Gift officers were deployed to interview constituents in person and by phone (usually this is done by a consultant for confidentiality). With respect to the Donor Insight Survey, I have several comments. I make these having hired over 20 consultants over the years and utilizing fundraising consultant’s studies in my work for over 25 years. This is a very good study and an interesting report – this Ms. Wyatt, is NOT a feasibility study. Let me first focus on the methodology. First, the survey was conducted by gift officers (staff). I presume this was a cost-saving measure because it is widely considered not to be a best practice to use anyone other than the consultants themselves for donor interviews. The reason for this is that donors will not usually make a candid comment to a staff member regarding what “best gift” they might make because there is an inherent feeling that a solicitation is being tested. In fact, in the section “Influence on making a gift”, only a small percentage of alumnae (13%) said that a development officer or College leader influenced their philanthropy. It is clear that these same donors were not likely to discuss their giving with the people who visited them. I have spoken to many reputable consultants on this topic and have received unanimous feedback that using staff would clearly skew results in a negative direction when assessing capacity of a donor and even inclination. To draw conclusions from a survey with this methodology would make me question both the findings and your use of them to support closure. The only conclusions you could legitimately draw from this survey (based on what the consultants were charged to do) is assess your donor’s reactions to possible changes. That is it. It is not fair nor appropriate to say that this survey could be used to show that a fundraising campaign would not be successful. Grenzebach Glier and Associates would have been delighted, I am sure, to conduct an actual feasibility study. 12 donors were capable of making a commitment of $1 million or more OF THE IDENTIFIED FOR THE STUDY. 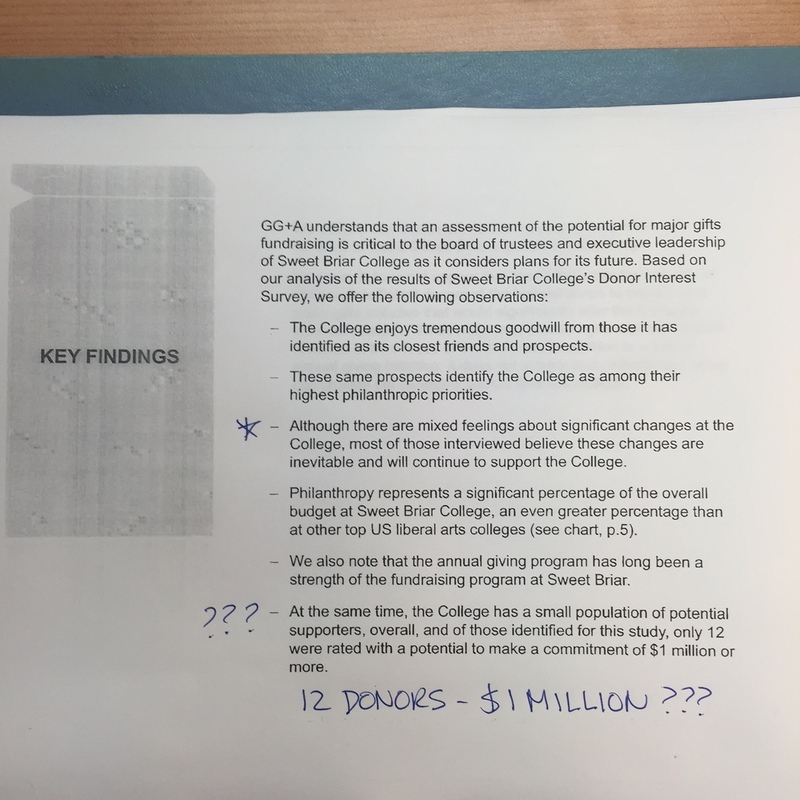 The financial analysis stating that “Only 12 donors were RATED (emphasis mine) as being capable of making a $1 million gift” is not a basis on which to evaluate fundraising potential. 12 donors of 139 is not a bad percentage. This figure of “12 donors” has been repeated by you and President Jones as if to say that there were only 12 $1 million donors in the entire population of Sweet Briar. This is not what the report is saying! There are MANY in the Sweet Briar community capable of major gifts and there are many capable of making smaller gifts adding up to a greater total. Work directed at both ends of the spectrum seems to have been lacking with key positions unfilled (I know this because I interviewed 18 months ago and the position was never filled). There was greater capacity when I worked for the College in the 1990s. That capacity should have grown since then, not gone down. Since that time, a greater percentage of our alumnae are working and capable of giving. There has been an intergenerational wealth transfer widely written about since that time. Donor after donor after donor report that they have been “hardly asked”, “asked for low-level gifts” and “ignored”. Many major donors report how badly treated they were by former Presidents — one was asked for a $3 million gift after no previous cultivation. The donor then gave a $25,000 gift in response — and the check was never cashed! Interviewees identified as major prospects (by the staff interviewers). 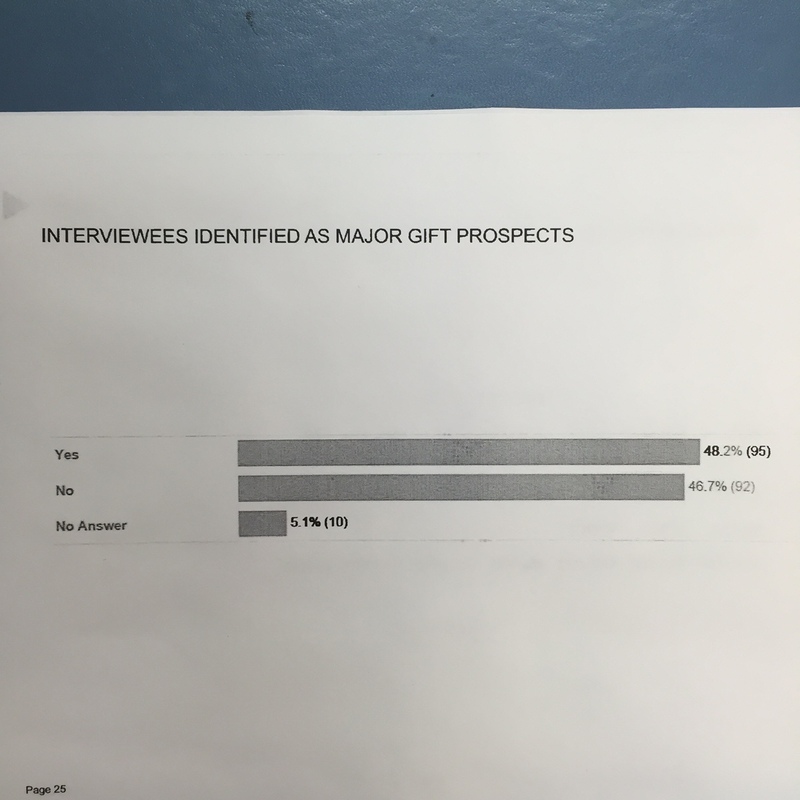 On page 25 of the report, it appears donors in the survey were evaluated for potential with a “yes” or “no” question as to whether they would make a major gift. I hardly think yes or no questions asked by staff would provide enough data on which to base a “no go” for a major gift effort. Furthermore, the majority of the respondents actually answered “yes” that they WOULD make a major gift in the Campaign. It is baffling how it could be determined that a fundraising campaign wouldn’t be worthwhile. If 48.2% (95 of your 139) could or would make a major gift — surely there would be some hope once you actually started talking to donor #140 and beyond. Your own consultant leads the way for a campaign to take place. I have used wealth screening by the same firm you used for your study. Throughout the survey, wealth screening “ratings” are used as filters for data. Wealth screening is only ONE measure to base capacity for fundraising success. I am currently using “Wealth Engine” data in my daily work and routinely find people rated extremely low who are capable of making very generous gifts. A donor rated by GGA wealth screening as being capable of a gift in the range of $1,000-4,999 made an eight-figure transformational gift of a building to my institution this past year. Had I relied on the rating, I never would have even spoken to this person. This is not the fault of wealth screening – electronic tools can only see so much. Professional fundraisers know this is a tool of many in a tool box and not a tool used to spear possibility. 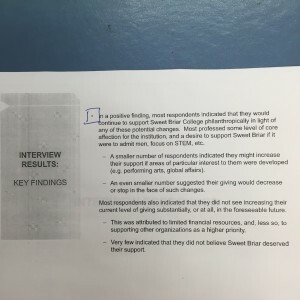 Most respondents indicated that they would continue to support Sweet Briar College philanthropically in light of ANY (emphasis mine) potential changes. The biggest issue I have with the survey is the questions it failed to ask and the issues it failed to raise. If this report was being used as a litmus test for whether the College might close, stronger questions could have been tested to indicate how alumnae might respond. A study is only as powerful as the questions and issues it tests. Stating there are “mixed feelings” about “changes at the College” such as going co-ed or focusing on STEM fails to ask the most obvious question — what would the donor do if the future were uncertain? These types of questions give a donor the chance to tap into how much they love a place. It also gives a glimpse as to what the donor might be willing to do if she felt it were threatened. It also allows them to realize that the future may NOT be certain. On the heels of this, a question about what a donor might be willing to do – when a neutral consultant is speaking to them – elicits the kind of information that truly assesses what might be possible. Guess what? That institution thrives today. Sweet Briar missed an opportunity – and continues to miss an opportunity – to be candid and to allow its alumnae to help. Conclusions about closure drawn from a survey that never actually asked about what a donor might do to avoid it is at best a missed opportunity and at worst, flawed analysis. We now know what alumnae and others are willing to do when they think the College’s future is in peril. They give. They give a LOT. As of this writing, they have given $16.5 million. A different wealth screening conducted by a reputable firm has reported a conservative estimate of capacity of over $100 million. The “resistance to change” cited in the report cannot be relied upon when the very donors with whom you spoke were not given the consequences of a lack of change — closure. The report clearly hints at the fact that “financial stability” was a key driver in why the report was written. Furthermore, ways the College might change should really not be solely in the arms of alumnae to hold and consider. Testing the ideas with potential students and industry partners — and then presenting that data to alumnae — would be a far better measure of what directions might be embraced. Sweet Briar 2.0, a collection of experts and passionate supporters of Sweet Briar, provides numerous ideas for future consideration. Your biggest clue in what alumnae would be willing to do lies in the “majority” of those who answered the question about Sweet Briar going co-ed. 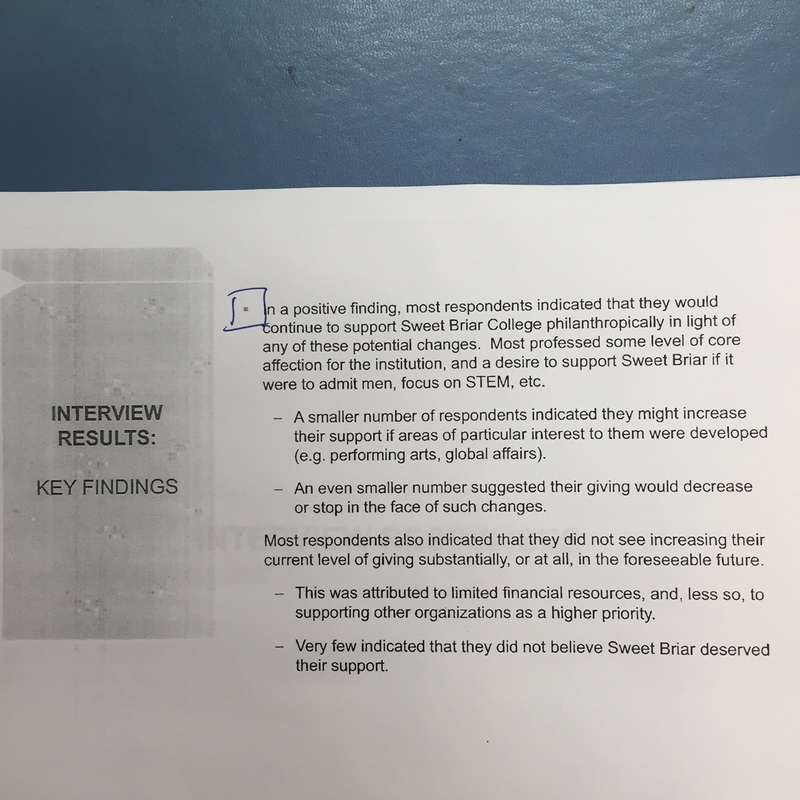 On the bell curve cited, a small percentage said they would stop giving if Sweet Briar went co-ed. A small percentage said they favored co-education. The report cites, “A large majority in the middle (a majority of your MAJOR DONORS mind you, emphasis mine)…would prefer a coeducational Sweet Briar to no Sweet Briar at all.” This section should have flashing lights around it for the boldness it contains. Even though you did not test the question of closure — the majority of your alumnae would rather see a changed Sweet Briar than none at all. Remember, this is only 197 people, not the wider community of alumnae who would likely have fallen into the same bell-curve. Of the 197, the report states, “Most indicated their willingness to support Sweet Briar in light of ANY of the proposed changes….” Did you just overlook this part? In short – the majority of your alumnae would have preferred ANYTHING to “no Sweet Briar at all”. This survey asking alumnae to make commentary on the weaknesses and strengths of Sweet Briar is both helpful and also not relevant. The alumnae interviewed had already CHOSEN Sweet Briar and are committed to it. Again, a market study of incoming Freshman is a far more valid source of information on the strengths and weaknesses of Sweet Briar. Note – to date that report (the Arts & Sciences report) cited has NOT been released. Having just been in Lynchburg this weekend and seen the thriving Randolph College and Lynchburg College, clearly there are many who choose this wonderful region for education. There are also many women who choose women’s education. It seems Sweet Briar stopped recruiting from the markets who would consider it, particularly Internationally. I have always respected the firm who produced the Donor Insights Survey — and I still do. In terms of timeline, my understanding is that this study was commissioned by the prior President, Jo Ellen Parker, but was not completed when she left. The current Board asked the firm to complete it, but without new direction for how it might be used. Again, the charge to the consultants was to help design a survey to test reactions to strategic planning priorities – NOT to conduct a feasibility study for a possible Campaign. Certainly not to do a survey that would be used to show no possibility of fundraising success. I have heard positive reports on the other consultants utilized by the College. Evidently another report addresses the enrollment issues, but that report has not been made available to alumnae. The Dr. Sax report has been debunked for its sample bias. The financial statements are now being amended with $17 million errors. It seems that a combination of flawed advice and, even worse, flawed conclusions led to where the Board sits today. You don’t need a study at this point to know what is possible — those working to save Sweet Briar College have proven that a fundraising effort is possible. Those working to save Sweet Briar College are WILLING to make the “significant investments of time and money”. On that point, we agree…that is what it will take. I am willing to give that time and money (and raise it) and I know there are thousands just like me. One of the first calls I would make would be to the very consultants who provided the road map to a positive conclusion — which you and your colleagues on the Board refused to see. It is clear you already made up your mind and you continue to keep your eyes shut to possibility. Note: Article updated throughout to include information verified by a representative of Grenzebach Glier and Associates who confirmed the timing of the study and the charge.